GOP Chair Pulling A Fast One To Dissolve the SCC at Convention? Show Him Who’s Daddy! 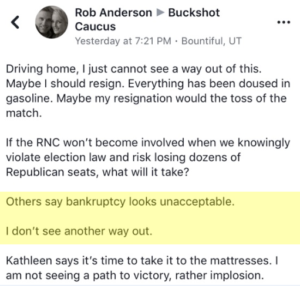 We were all in disbelief when Utah GOP Chairman & Buckshot Caucus Member Rob Anderson revealed his intention to bankrupt the Party. Many suspect it was to create a new Party under the name “Republican Party of Utah” registered by CEO Taylor Morgan of Count My Vote. Despite Rob Anderson “fighting [him] at every step”, Dave Bateman stepped forward and eliminated over $400,000 of Party debt to keep the Party solvent and out of bankruptcy. This angered the Buckshot Caucus members who were squarely advocating for the death of the Caucus-Convention System. Within 10 days of Bateman’s agreement to pay off the Party’s debt, Rob Anderson’s close friend, Senator Todd Weiler attempted to contact Bateman’s Ex-Girlfriend promising her $1,000,000 if she would bring sexual harassment claims against him. She was appalled and refused to even talk to him. Listen to the voice mail he left in an attempt to seduce this woman into participating in the scheme. The police briefly opened an investigation, and quickly closed it, stating their was no extortion even though there is a mountain of evidence to the contrary. Senator Weiler must have a lot of “very well connected friends”. Now that Anderson’s intentions of bankrupting the Party “looks unacceptable” because Bateman paid off the debt, Anderson might be moving to Plan B—to sneak a new Constitution and Bylaws in front of the State Delegates at the nominating Convention on April 21st. If he tries it, delegates need to be informed and ready to vote “No”. In his message to the left, Anderson first expresses his plan to shut down discussion and productivity in State Central Committee Meetings, which he has done. On December 16, 2017, Anderson made robocalls, emails, messages, and Facebook posts to tell members of the State Central Committee and told a special State-Central Committee meeting was cancelled when it was not, and was properly held, recognized, and ratified. On February 24, 2018, when the road conditions were more than acceptable, Anderson encouraged members of the State Central Committee to stay home and not attend. He promised to excuse absences of those who did not attend, and in so doing, violated Party bylaws which grant him no such authority. Anderson also scheduled facilities for State Central Committee meetings at venues with hard-stop time constraints preventing important party business from being conducted. A bylaw proposal has even been submitted making it nearly impossible to ever again call a special meeting without the Chairman’s support. Second, Chairman Anderson wrote “We might try to introduce a entirely new [Constitution & Bylaws] for vote at the nominating convention.” Wow, scary, but there’s more. The deadline to submit new Constitution and Bylaw amendment proposals was last Thursday, March 22, 2018 at 5pm. It was reported publicly that access to amendment proposals was revoked from the Chair of the C&B Committee, Janice Legler, just hours before the deadline preventing her from seeing any final submissions. As of this morning, despite repeated requests, all members of the C&B Committee are still being denied access to the Amendment submissions with the Convention just weeks away. Even if there is no nefarious plan to swap the C&B, the C&B Committee and delegates need time to adequately vet amendment submissions. Whichever way you cut it, withholding the proposals is harming the Party. 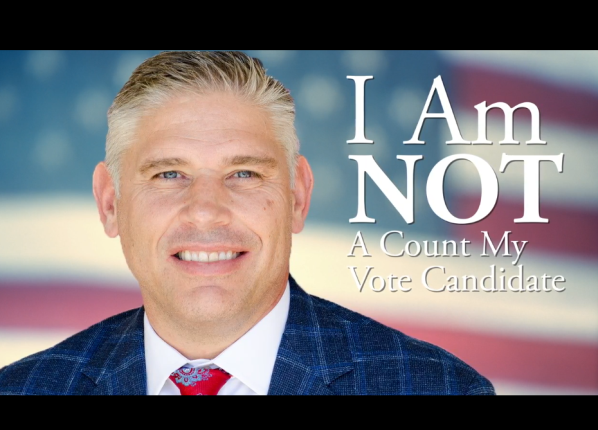 A State Central Committee member reported that Rob Anderson wanted to sneak through a wholesale change of the Constitution and Bylaws while serving as Chair of the Davis County Party a couple of years ago, increasing the likelihood that he might be planning this tactic. Ready for things to get wacky? 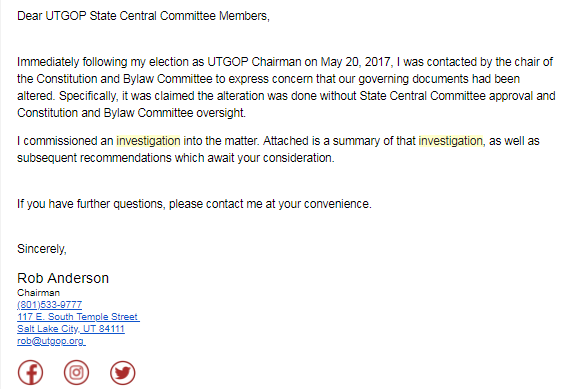 On January 4, 2018 Rob Anderson sent an email to State Central Committee Members announcing a witch hunt into Party Secretary Lisa Shepherd, claiming she’d made unauthorized changes to Party bylaws. Here’s the investigation summary. Of course the C&B Committee was never asked to participate in this secret investigation carried out by Anderson. Anderson even engaged an outside legal firm (Snell and Wilmer) without approval from the SCC or the C&B Committee to conduct the expensive secret investigation. 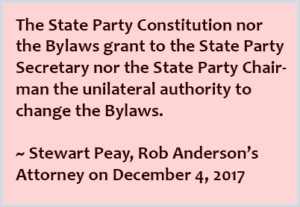 Why would Chairman Anderson conduct an expensive third party legal review of Ms. Shepherd’s “immaterial” changes and smear her to the entire State Central Committee for trying to do her job well? Why not just revert the changes, and push the formatting changes through in a proposal at the Convention? Perhaps his goal was to smear Secretary Shepherd at Convention like he did to the State Central Committee. Or Maybe the Chairman’s goal was to create some case to use these “immaterial” modifications to seed doubt among the State Delegates that the Bylaws weren’t legitimate. That might just lay the foundation for a quick, unexpected, vote to completely replace the governing documents at Convention with a version delegates don’t have time to vet. Maybe, just maybe, that new version would eliminate a State Central Committee? Hopefully we’re all interpreting this wrong, and Anderson abandoned has plan to dupe delegates into ratifying fraudulent versions of the Constitution and Bylaws during the Convention; however, this is no time for complacency. We were all deceived last Convention when Anderson called people “fear mongers” who accused him of being the Count My Vote candidate. Fool me once, shame on you…. You know the rest. 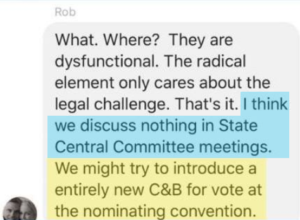 Perhaps its coincidence that Rob Anderson threatened the GOP Executive Committee (according to members present) that he would cancel the Convention if Buckshot Godfather Kurt Bramble wasn’t in charge of credentialing, and Buckshot Member Accused of Extortion — Senator Todd Weiler wasn’t in charge of the Rules Committee. The Committee negotiated with Anderson to drop Weiler, but keep Bramble on the credentialing committee. 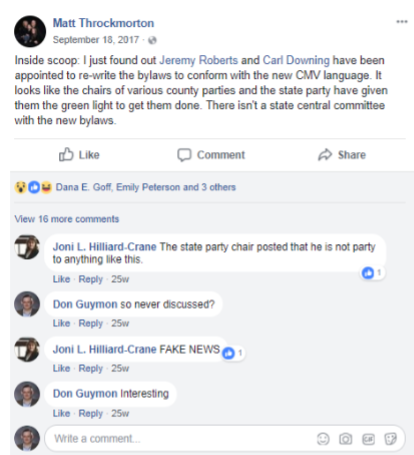 It’s probably also worth mentioning that State Central Committee member Don Guymon posted in a public forum that Matt Throckmorton, former C&B Chair and State Legislator, had heard that two prominent members of Buckshot Caucus were attempting to covertly substitute new Constitution and Bylaws during the Convention this year. 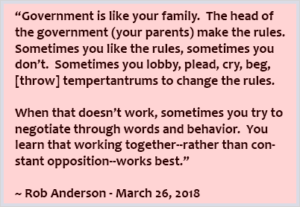 On March 26, 2018, Rob Anderson was interviewed by Kurt Manwaring who later published the interview, quoting Anderson who referred to the delegates, the SCC, and Republicans who oppose him as children who “lobby, plead, cry, beg, [& throw] temper-tantrums”. Anderson thinks he’s the parent and makes the Rules. I hope all of us are bold enough to kick and scream, until Anderson starts respecting delegates, State-Central committee members, our governing documents, and all Utah Republicans. He thinks he’s big Poppa and gets to make the rules. If he tries to pull off the Constitution & Bylaw Changeroo on April 21st, let’s be ready to show him “who’s daddy”. I’m an alternate county delegate. Will I have any vote in this matter, should I be needed? Rob Anderson and Todd Weiler are insufferable. It is amazing to see the secret combinations using every immoral method to get power, gain, and glory right before our eyes. What about getting a new daddy and mommy since these ones are clearly the ones acting like children? Maybe us kids could divorce our crazy parents, or at least sue to become emancipated minors? YEA BABY…finally his pure intentions are documented precisely! Can a no confidence vote be brought against Rob Anderson at Convention. This sounds like a very twisted web of who is and who isn’t. I hope all who attend are smart enough to smell the RATS in the pile and physically throw them out. Not only because of the federal Republicans bring so overwhelmingly inept at governing but the state Republicans being so rotten throughout with corruption that I do not trust anyone any more and I am going Independent. No more support- no more backing- no more contributions to any one!!!! !